INTRODUCTION: Indian national law namely Cigarettes and Other Tobacco Products Act (COTPA) exists since 2003 and aims at protecting all the people in our country, but smoking is still prevalent among people. This study was aimed to assess awareness, attitudes, and practices regarding prohibition of sale of tobacco products near educational institutions of Nellore city, India. MATERIALS AND METHODS: A descriptive cross-sectional study was conducted in degree colleges of Nellore city of Andhra Pradesh. The study population includes institutional personnel (student, teaching staff, nonteaching staff, and workers) of selected degree colleges of Nellore city. A structured questionnaire was designed for this study which was validated by Davis criteria; reliability was assessed by test–retest design. The questionnaire was divided into five parts consisting of demographic details (age and gender), smoking behavior, knowledge about tobacco control laws, attitudes toward the law and policies, and practices followed in the institution. Logistic regression analysis was used to find out the association between different independent variables to tobacco usage among institutional personnel. RESULTS: Among the study population (n = 400 [100%]), 75.8% of the teaching staff do not know that there should be a board in the institution saying that “sale of tobacco product in an area within the radius of 100 m of educational institution is strictly prohibited,” 82.2% of the study population were not aware to whom should they report, 96.3% of the study population accepted that strict execution of COTPA law saves life, the participants who answered no to strict implementation of COTPA law, and to punish the person who is violating the COTPA law are susceptible to 0.28, and 0.14 times greater odds to be a smokeless tobacco user, respectively. CONCLUSION: The study concluded that there was lack of knowledge about smoke-free legislation among the study population and a high support for strict implementation of COTPA. As members of the health-care system, health-care professionals have a recognized responsibility in reducing tobacco-related diseases. Till now, many studies are concentrating more on the burden of the tobacco-related diseases than how to prevent the use of tobacco-related products. COTPA Bill 2015 was enacted by the Indian parliament in further attempts to amend the COTPA bill 2003; the following are the modifications done in 2015 under this section: prohibition of sale of cigarettes or any other tobacco products to any person who is under 21 years of age, prohibition of sale of cigarettes or any other tobacco products in an area within a radius of 100 m of any educational institution, prohibition of sale of cigarettes or any other tobacco products loose, and prohibition of any person who is under 18 years of age in cultivation or processing of sale of tobacco products. Having multiple forms of tobacco in use, limited resources for cessation, and few social norms to support quitting in India provides challenges for reducing these daunting numbers. In addition, the presence of relatively lax tobacco control laws in several regions of India creates an enabling environment for the tobacco industry to target certain population niches with tobacco products. Surrounding influence, stress, fun, and peer pressure are the major reasons for smoking initiation. Even among college personnel who may not completely quit tobacco use, the opportunity to abstain from tobacco products during college hours or on college premises out of compliance with college policies or even simply because of difficulty in accessing tobacco products within the college vicinity could potentially reduce daily tobacco consumption. Keeping in mind these considerations, the present study was aimed to assess awareness, attitudes, and practices regarding prohibition of sale of tobacco products near educational institutions of Nellore city, India. A descriptive cross-sectional study was planned to assess the awareness, attitude, and practices regarding smoke-free legislation and tobacco usage among institutional personnel of degree colleges of Nellore city, India. The study population included were institutional personnel (student, teaching staff, nonteaching staff, and workers) of selected colleges of Nellore city. All willing participants who were available at the time of interview were included till the required sample size was met. The sample size calculated with a 50% proportion, 95% confidence interval, and 6% absolute precision was 400. Ethical approval for the study was obtained from the Institutional Ethics Committee, Narayana Dental College and Hospital, and an official permission was obtained from the concerned institutions where the study was done. The questionnaire which was designed for this study was validated by checking content validity using Content Validity Index with Davis criteria, 1992. It was given to two experts in the field of dental research and public health and their response was recorded; item and scale content validity was checked and the Item Content Validity Index score was 1.0 and 0.9 for two experts, respectively, and Scale Content Validity Index score was 0.9 for both experts which was acceptable. The questionnaire was tested for face validity to assess cross-cultural sensitivity when translated into local language by two bilingual experts. A pilot survey was conducted on one of the educational institutions of Nellore to assess the reliability of the questionnaire by using test–retest design. It was given to 25 participants, twice with 7 days apart. The internal consistency of the questionnaire using Cronbach's alpha statistics was 0.79, which indicated significant correlation. Ethical clearance was taken from the Institutional Ethical Committee of Narayana Dental College and Hospital (NDC/PG-2015/EC/2015). A list of undergraduate degree colleges was obtained from the Education Department of Nellore Corporation. Among a total of 13 degree colleges in Nellore city, two were government degree colleges and 11 were private degree colleges. Ten degree colleges were selected by simple random sampling method (8 private colleges and 2 government colleges) and forty individuals were selected from each institution. Institution personnel were selected based on population proportion to size of the selected degree college. Data were collected using a pretested, structured questionnaire in their respective institutions. Questionnaire was distributed and interviewed to the educational institutional personnel who were available at the time of investigation of the selected degree colleges. Fisher's exact test was used to calculate proportion for all the variables used in the study. Logistic regression analysis was used to find out the association between different independent variables to tobacco usage among institutional personnel. Data were collected and analyzed using SPSS software version 22 (IBM Corp, Armonk, NY, USA). Of the 400 (100%) participants in the present study, 253 (63.2%) were 18–22 years old and 147 (36.8%) were 25–60 years old; males constituted 285 (71.3%) and females 115 (28.7%). Among those, 254 (63.5%) were students, 62 (15.5%) were teaching staff, 51 (12.8%) were nonteaching staff, and 33 (8.3%) were workers. [Table 1] summarizes that 4.7% of students, 14.5% of teaching staff, 21.6% of nonteaching staff, and 15.2% of workers were current smokers and 1.2% of students, 15.7% of nonteaching staff, and 30.3% of workers were current smokeless tobacco (SLT) users, 96.8% of teaching staff never used SLT. [Table 2] summarizes the knowledge of students, teachers, nonteaching staff, and workers smoke-free law; 75.8% of the teaching staff were not aware that there should be a board in the institution saying that “sale of tobacco product in an area within the radius of 100 m of educational institution is strictly prohibited,” 74.4% of the students were not aware that, on any shop/bunk with in radius of 100 m from educational institution, there should be a board saying that “tobacco products are not sold to persons below 18 years of age,” 82.2% of the study population were not aware of the maximum fine for violating the rule, 84.8% of the study population do not know who is the enforcing agency of the law, 100% of the workers do not know to whom should they report if they see any one violating the law, and 76.6% of the study population are not aware that permitting sale of cigarettes and other tobacco products loose or in single sticks is prohibited. Regarding awareness of harmful effects of tobacco among the study population, 97.0% of the total respondents answered no to “smoking is part of our culture,” 88.0% of the respondents answered yes to “smoking/using tobacco products is harmful to health,” 76.0% of the total respondents answered yes to “smoking/using tobacco products is harmful to oral health,” 50.2% of the total respondents are aware of second-hand smoking, 56.5% of the total respondents answered yes to “second-hand smoking is equally dangerous as active smoking,” and 95.5% of the total respondents are aware that smoking causes environmental pollution [Table 3]; statistically significant difference was seen between smoked tobacco (ST)/SLT users and nonusers toward strict implementation of COTPA law and strict punishment of the person who is violating COTPA law [Table 4]. Regarding policies and practices in the institution among private and government colleges, 90.3% of the total respondents answered that their institution do not have written policy against smoking/chewing tobacco products, 90.8% of the total respondents answered yes to the question of “does in your institution smoking or chewing tobacco products is prohibited,” and 90.3% of the total respondents answered that they do not have any posters of “No Smoking” displayed in their institution; thus from the results of the present study, it can be observed that there is no significant difference in policies and practices followed in the private and government institutions [Table 5]. Logistic regression analysis was employed to determine the association between tobacco usage and attitude toward the law; the participants who answered no to strict implementation of COTPA law, to punish the person who is violating the COTPA law, and support COTPA law are susceptible to, respectively, 0.28, 0.04, and 10.77 times greater odds to be a tobacco smoker user as compared to those who answered yes and the participants who answered no to strict implementation of COTPA law and to punish the person who is violating the COTPA law are susceptible to 0.28 and 0.14 times greater odds to be a SLT user, respectively [Table 6]. Tobacco retail outlets that are physically nearby colleges may require little time, distance, or effort to access and use tobacco products. It is also conceivable that college personnel might visit such nearby retail stores to buy other nontobacco products, but end up buying tobacco because of mere sight of tobacco products. The risks of tobacco-related diseases are higher among those who start early and continue using it, and hence a review of national guidelines to regulate and evaluate the accessibility and availability of smoking products in and around the workplace may be needed. The purpose of this cross-sectional study was to assess the awareness, attitudes, and practices regarding prohibition of sale of tobacco products near educational institutions of Nellore city, India. Smoking prevalence in our study was 9.6% in people aged 15 years and above. These data are not in congruence with the Global Adult Tobacco Survey-India (2009–2010) data, wherein 6.9% of the adults of Andhra Pradesh were reported as current smokers. The National Family Health Survey-3 survey concluded that 32% of the Indian adults were current smokers. Grills et al. in their study in Uttarakhand found that 54.0% of males and 3.7% of females ST. Saraswathi et al. in a study in South India reported smoking prevalence rate to be 15.02%. These relatively wide range of smoking prevalence estimates can be attributed to differences in the socioeconomic, cultivation, and other factors in different locations of the studies. Awareness on the harmful effects of smoking was widely regarded by scholars to play an important role in the initiation and maintenance of cigarette smoking. The majority of participants in this study had a negative opinion on smoking. Similar to our finding, a study on awareness of the health risks of smoking observed that the majority of smokers agreed that smoking was “not good” for their health. We found that 88.0% were aware of the fact that smoking is harmful to health and 56.5% viewed second-hand smoking to be equally dangerous as active smoking. Nearly similar findings were reported in a study done by Desai et al. on tobacco smoking patterns, awareness, and expenditure in the state of Gujarat, India. Students are less aware of the harmful effects of smoking compared to others; further, teaching staff are more aware of the ill effects of second-hand smoking compared to others. Humans learn most cultural traits by observing their peers. India's culture is about its unique qualities that have evolved and survived time. The finding from the present study that most respondents perceive smoking as not a part of our culture is a step in making this district of Nellore smoke free. In our study, policies and practices followed by institutions toward COTPA act showed no statistically significant difference between government and private colleges; if government colleges implement the laws, then private institutions also try to implement the laws. The results of the present study found that majority of the institutional personnel of both government and private colleges were not aware of the COTPA law. The knowledge toward COTPA act in our study was significantly better among students, teaching staff, and nonteaching staff as compared to workers of the institution. In the present study, education was significantly associated with better knowledge about smoke-free law. Higher proportion of literate study participants were aware of the fact that smoking is banned in and around educational institutions and wanted government to take appropriate actions to control the smoking epidemic. 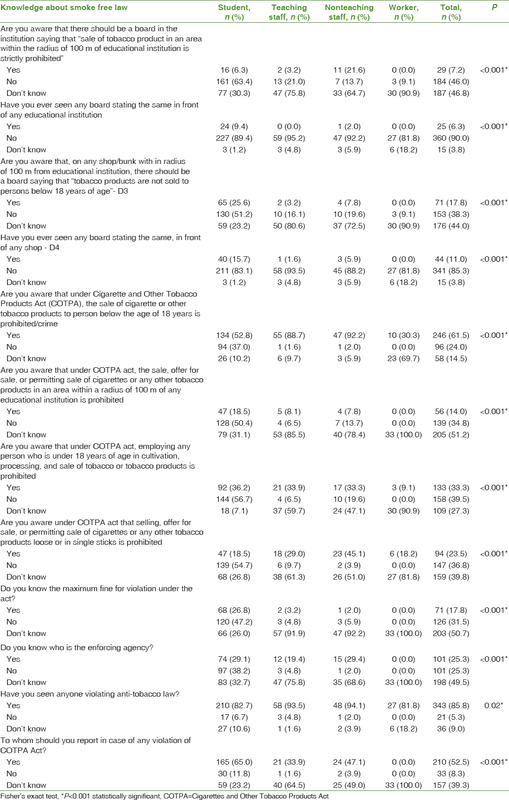 In the present study, people who do not use tobacco had a significantly higher positive attitude toward COTPA as compared with their counterparts. A study done by Goel et al. on public opinion on smoking and smoke-free legislation in a district of North India reported that nonsmokers have better positive attitude toward COTPA compared to smokers. A study organized by the WHO to determine the smoking habits, knowledge, and attitude toward tobacco control of health professionals found that smoking study participants had less favorable attitude toward tobacco control compared to nonsmokers. 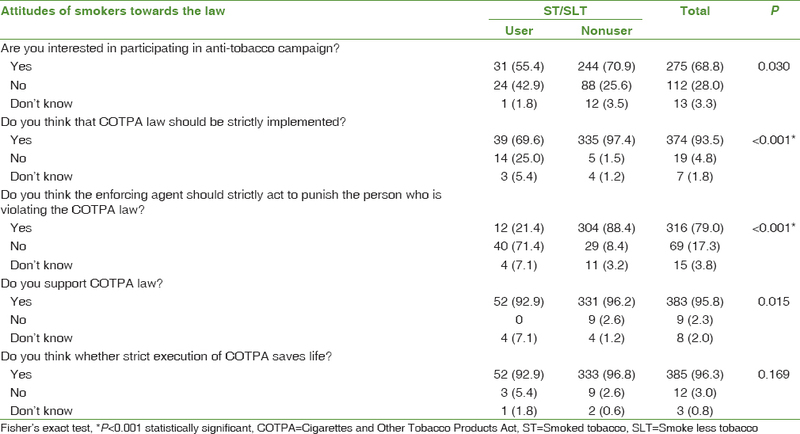 Nearly 90% of the respondents in our study supported smoke-free law COTPA. Around the world, countries which successfully introduced smoke-free laws have witnessed widespread public support for it. A survey carried out in Latin America showed that more than three-fourth of the respondents supported smoke-free public places. In Scotland, smoke-free legislation has been widely supported both prior to and after implementation of the ban. The pervasive availability of a multiplying array of tobacco products in local retail outlets around educational institutions, coupled with a growing body of evidence on the impact of outlets on smoking behavior,, suggests that the current outlet environment may be a contributing factor in promoting adult tobacco product experimentation and initiation. Strict execution of tobacco control laws in and around educational institutions and licensing and zoning policies to restrict tobacco outlet density may be instrumental in reducing tobacco use initiation. In spite of 10 years after the COTPA amendment has passed, majority of the study population are not aware of this anti-tobacco law, and there is clear evidence that the rules are being violated as tobacco products were available within 100 yards around all the educational institutions in Nellore. Hence, there is a need for intensified efforts to limit the distance of tobacco retail outlets from educational institutions and implement institution policies which prohibit the use of all types of tobacco products, by all persons, at all times, and in all areas of institutional premises so as to renormalize tobacco use. This study was done in degree colleges of Nellore, and hence cannot be generalized to all people. Hence, more studies should be done including various educational institutions covering large areas of population. Further, it is recommended to study other sections of COTPA act, as this study was done on only one section of COTPA act. Further, strategies comprising of successful comprehensive tobacco control programs and smoking cessation programs should be directed in educational institutions. This is a self-funded study. World Health Organization. Framework Convention on Tobacco Control. Geneva, Switzerland: WHO Document production Services, Geneva; 2004. The Cigarettes and Other Tobacco Products (Prohibition of Advertisement and Regulation of Trade and Commerce, Production, Supply and Distribution) Amendment Bill 2015. Government of India, Ministry of Health and Family Welfare (Tobacco Control Division); 2015. p. 5-6. Chezhian C, Murthy S, Prasad S, Kasav JB, Mohan SK, Sharma S, et al. Exploring factors that influence smoking initiation and cessation among current smokers. J Clin Diagn Res 2015;9:LC08-12. Davis LL. Instrument review: Getting the most from your panel of experts. App Nurs Res 1992;5:194-7. Lynn MR. Determination and quantification of content validity. Nurs Res 1986;35:382-5. Waltz CF, Bausell RB. Nursing Research: Design, Statistics, and Computer Analysis. Philadelphia: F. A. Davis; 1981. GATS India Report-South-East Asia Regional Office. Available from: http://www.searo.who.int/LinkFiles/Regional_Tobacco_Surveillance_System_GATS_India.pdf. [Lastaccessed on 2017 Oct 25]. India Use of Tobacco Factsheet NFHS-3 Survey finding. Available from: http://www.whoindia.org/LinkFiles/Tobacco_Free_Initiative_nfhs3.pd. [Last accessed on 2016 Oct 20]. Grills NJ, Singh R, Singh R, Martin BC. Tobacco usage in Uttarakhand: A dangerous combination of high prevalence, widespread ignorance, and resistance to quitting. Biomed Res Int 2015;2015:132120. Sansone GC, Raute LJ, Fong GT, Pednekar MS, Quah AC, Bansal-Travers M, et al. Knowledge of health effects and intentions to quit among smokers in India: Findings from the tobacco Control Policy (TCP) India pilot survey. Int J Environ Res Public Health 2012;9:564-78. Desai KT, Gharat VV, Nayak SN, Patel PB, Bansal R. Tobacco smoking patterns, awareness and expenditure: A cross-sectional overview from Surat city, India. Tob Control Public Health East Eur 2012;2:25-32. Available from: http://www.andreevin.narod.ru. [Last accessed on 2016 Oct 24l. Goel S, Singh RJ, Sharma D, Singh A. Public opinion about smoking and smoke free legislation in a district of North India. Indian J Cancer 2014;51:330-4. Behbehani NN, Hamadeh RR, Macklai NS. Knowledge of and attitudes towards tobacco control among smoking and non-smoking physicians in 2 Gulf Arab states. Saudi Med J 2004;25:585-91. GTSS Collaborative Group. A cross country comparison of exposure to second hand smoke among youth. Tob Control 2006;15 Suppl 2:ii4-19. Hilton S, Semple S, Miller BG, MacCalman L, Petticrew M, Dempsey S, et al. Expectations and changing attitudes of bar workers before and after the implementation of smoke-free legislation in Scotland. BMC Public Health 2007;7:206. Cantrell J, Pearson JL, Anesetti-Rothermel A, Xiao H, Kirchner TR, Vallone D, et al. Tobacco retail outlet density and young adult tobacco initiation. Nicotine Tob Res 2016;18:130-7.